It is a source of perpetual fascination to me how much (or how little) British filmmaking was obsessed with war in the early 1940s. On the one hand, it might be expected that the dominant topic of all conversation would be translated into film- for the war dominated every horizon in a way that generations since have not known. On the other hand, it could be supposed that the general public, satiated with the fighting, would yearn for escapist entertainment- to get as far away from wartime activities as possible- and that this would communicate itself to film producers and lead to a revamp of production. In fact, war did dominate the films produced in Britain in the early 1940s- a typical year being 1941, where even ostensibly comedic films like The Ghost of St. Michael’s featured enemy agents. World War II was also notable for some Anglo-American co-productions which seemingly assured box-office revenue on both sides of the Atlantic. One such co-production was Dangerous Moonlight, produced by RKO Radio British Productions (whose short c.v. includes exactly ten films) and the American RKO Radio Pictures (whose c.v. is somewhat larger). 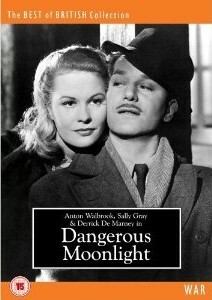 Directed by Brian Desmond Hurst and written by Terence Young (who would later go on to direct no less than three Bond films in the 1960s), Dangerous Moonlight boasts an intriguing roster of stars ranging from Anton Walbrook and Derrick De Marney to the ever-underrated Cecil Parker and sterling character actor John Laurie. The plot of the film- with its overtones of sacrifice and duty- provided a microcosm of the war, as choices had to be made, decisions taken, which affected not only one person but others. 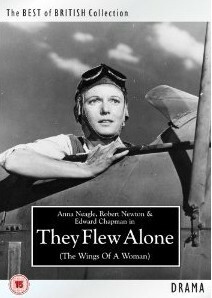 A variant on the wartime theme is offered by They Flew Alone (Wings of a Woman), which, given that it was released in wartime, is a piece of propaganda posing as a biopic of Amy Johnson. This time, the director’s chair is taken by Herbert Wilcox, who would marry the film’s star- the charming Anna Neagle- a little over a year after They Flew Alone was released. The screenplay was written by Miles Malleson (who evidently sought to endorse his established character actor reputation by playing, bizarrely, a vacuum salesman), and featured the never-knowingly-underacted Robert Newton as Jim Mollison, Amy Johnson’s husband. Although the overall cast is less star-studded than Dangerous Moonlight, They Flew Alone is still respectable- and, it must not be forgotten, was released only 16 months after Amy Johnson’s mysterious death, so she was still very much in the public imagination. Both Dangerous Moonlight and They Flew Alone are quintessentially 1940s, and, as such, their legacy is less certain than something like The 39 Steps or even In Which We Serve as the plot is built up with war as a background (be it a highly important one) rather than foregrounded. In short, the character development present in a film like In Which We Serve is more likely to endear it to future audiences than the rather hastily contrived Dangerous Moonlight where those who are ‘to stay’ and those that are ‘to bomb’ are not chiselled with any great care or attention. This comment made, it is important that these parts of our cinematic heritage are made available- for they serve as historical documents as well as reminding us of a time when we actually had character actors to populate such films. 'Dangerous Moonlight' and 'They Flew Alone' are available on DVD from Odeon Entertainment.